Not only the buyers or viewers are taking note on S5 but also the companies that manufacture handsets are paying a great attention on Samsung S5. Samsung on the day of launch is targeted by companies like Nokia and HTC. These companies are always the first to troll other companies down. It seems that Samsung really doesn’t have any good relations with anyone in the market. As Nokia have done it many times before even, twitting Samesung jokes. Last joke of Nokia was on Sony’s new camera lens. This time Nokia twitted an image of Lumia handset captioned “Not the Samesung” reading “Stand out from the crowd”. Definitely Nokia Lumia stands out from the crowd as not much people carry a Lumia. Why does these companies tweet something that can backfire at them. HTC even twitted about GALAXY S5. 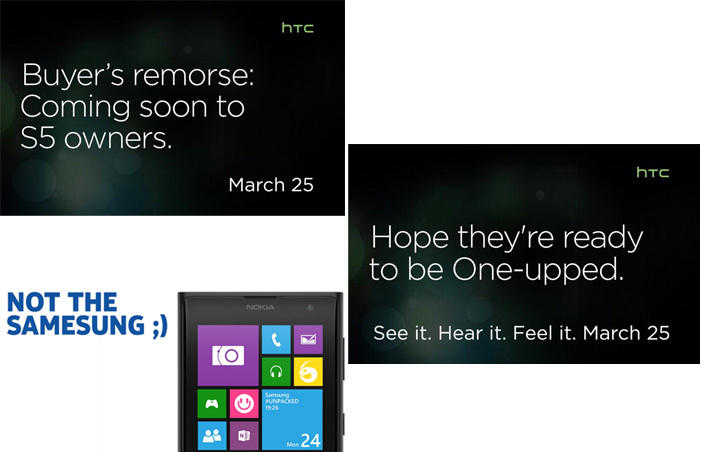 Its tweet was straightforward saying “Buyer’s remorse: Coming soon to S5 owners.” HTC also twitted “Hope they’re ready to be One-upped”. HTC have many fans when we talk about its technologies and phones but when it comes to sales, all of us knows who wins the battle and who will. Twitting negative about a company might not work in favor of HTC when it will launch its next device. Whatever anyone tweets or comment about SAMSUNG, it’s one of the leading companies in sales of its product; its market can’t be affected by a few tweets. SAMSUNG GALAXY S5 will surely light the market.